I love a fun girl’s night out, and what better way to hang out with your girls than at an advanced showing of Bad Moms? The movie (click here to watch the trailer) stars Mila Kunis, Kristin Bell, Jada Pinkett-Smith, Christina Applegate, and some other amazing actresses. 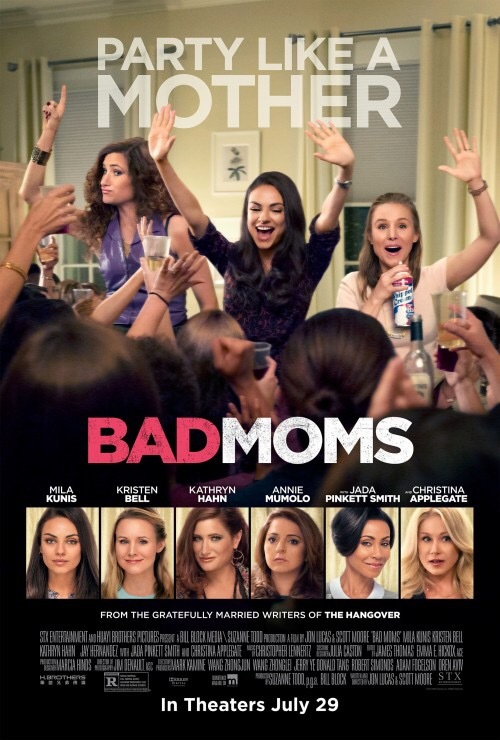 A Moxie Mom has partnered with STX Entertainment to offer my readers tickets to an advanced screening of Bad Moms at Santikos Embassy on Thursday, July 21 at 7 pm. The movie officially opens nationwide onJuly 29th! In this new comedy from the writers of The Hanger, Amy has a seemingly perfect life – a great marriage, over-achieving kids, beautiful home and a career. However she’s over-worked, over-committed and exhausted to the point that she’s about to snap. Fed up, she joins forces with two other over-stressed moms on a quest to liberate themselves from conventional responsibilities – going on a wild, un-mom-like binge of long overdue freedom, fun and self-indulgence – putting them on a collision course with PTA Queen Bee Gwendolyn and her clique of devoted perfect moms. If you’d like to join in on the fun, be sure to follow this blog and then go to http://stxtickets.com/MoxieBadMOM and use CODE: MoxieBadMOM to reserve your free tickets to see Bad Moms before its official release! Each pass will accommodate 2 people and seats are on a first come-first serve basis.